I have placed a powder blue men's sweater up on the Marketplace, for sale for only 3 CC until Christmas Day. Bundle up on those wintry islands! 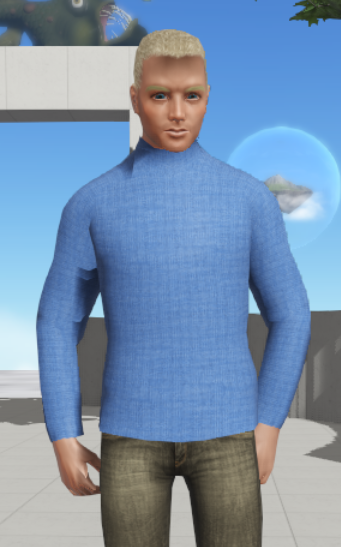 Search for "mens blue sweater" or "mens" or just "sweater" to find it in the Marketplace. 1 Cloud Coin (CC) - US$0.05 so you're getting a real bargain for only fifteen cents for this garment. RANT: GROW UP AND STOP GRIEFING STARTING ISLAND. Exclusive Photos of the New Starting Island!